KMIDS expects all students be in proper and complete school uniforms every day. Wearing school uniforms promotes dignity and pride in being a student. Uniforms can be purchased at the school store. 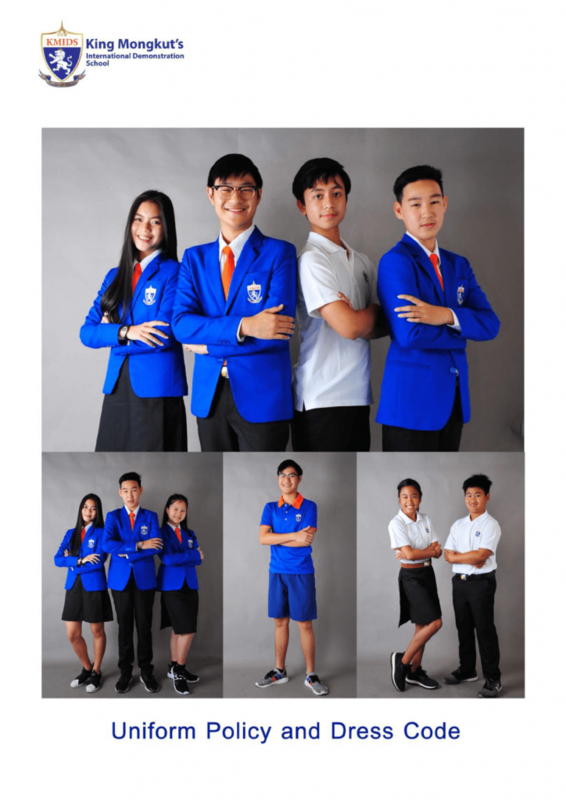 a. PE uniforms are available in different sizes for purchase at the school’s uniform shop. b. These outfits and proper athletic footwear should be worn during PE hours only. c. It is a requirement for all students to wear PE uniforms for physical education classes. d. Students should change to their regular school uniforms after PE classes. e. Appropriate sports shoes or sneakers must be worn. Any appropriate shoes or sneakers as long as it’s 70% black. Slippers, flip-flops or sandals are unacceptable. Please note that ear piercing is the only type of piercing allowed. No tattoos or piercings are allowed on other body parts. Hairstyles should be neat and clean. Boys’ hair should reflect a neat and tasteful style. Expensive jewelry should not be worn to school. Headbands and hair ornaments, watch, a small pair of earring. Multiple piercings, visible tattoos, leg warmers, hats, and any other expensive jewelry. The school is not responsible for any lost jewelries and accessories inside the school. Students with improper uniforms will not be allowed in class. Parents will be contacted and the student will be required to change into the correct uniform.